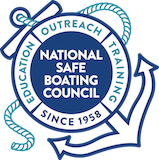 Boaters call navigation rules – the basic laws governing the steering or sailing of a boat – “The Rules of the Road.” The Rules of the Road define the roles and responsibilities of vessel operators. If all operators obeyed these rules, most accidents could be avoided. The Rules vary slightly depending on whether you are boating on inland or on international waters. As an example, when operating on inland waters, sound signals are signals of intent; when operating on international waters, they are signals of action. There is much more to the navigation rules than can be covered here.